Yusra Husain, The Times of India, Lucknow, December 22, 2014 MALIHABAD: On a foggy Sunday afternoon, the otherwise quite Malihabad bounced to its Pathani vigour as a group of Afridi Pathans sat in the orchard of revolutionary poet Josh Malihabadi and conversed with Rabbi Dr Ari Zivotofsky. It was meant to be a session in which the rabbi would have asked the Afridi Pathans questions about their traditions and history, but he found himself facing questions from youth who were anguished about the constant research on their genetics by Israelis. The questions were not limited to what the Afridi Pathans said were "false claims" trying to find their roots to Judaism, but also included the situation between Palestine and Israel. Rabbi Dr Ari Zivotofsky decided to visit Malihabad to study the historical ancestry of Afridi Pathans in the region, after his interest was aroused in previous research on the subject. Earlier hypotheses claimed resemblance between certain traditions revolving around the common Semitic customs of Afridi Pathans with those of the Jews, hinting towards a probable connection between the two. "Five years back when Shehnaz Ali visited us in Malihabad to take DNA samples of the Pathans, she misguided us about the real motive of her research. She told us it was to reaffirm if the Afridi Pathans of present day held the same warrior qualities and other characteristics of their ancestors hundreds of years back. We later got to know that it was to find a link of Pathan ancestry with Jews," complained Ahsan Javed Khan, a raging Afridi Pathan, host to an Israeli scholar visiting the small tehsil, who was in Malihabad researching on Pathan history. Speaking about his experience of the meeting, Zivotofsky said, "I am not intimidated by their questions but actually surprised with how offended the Afridi Pathans are by this research and how careful one has to be with an apolitical and benign approach." The young men pointed out anomalies in previous research carried out by other individuals and averred that DNA studies done earlier could found no conclusive result. The Pathans also claimed that the research might have a political motivation in case one of the earlier researches was funded by Israel's foreign ministry. "The points raised here have intrigued me to follow up on the research done back then. If no conclusive results were found probably the researches couldn't arrive at the expected results so they didn't publicise them. I would now like to get into those flaws," said Zivotofsky. In the old Kothi of Khalid Yusuf, belonging to the earliest families of Afridi Pathans in Malihabad, Dr Ari spoke about an oral tradition passed on through generations. "I remember my grandmother telling me that we belong to Bani Israel (Children of Israel) and Ephraim, however this does not mean that we are Jews. Why do Israelis want to trace our ancestry to one of the lost tribes of Israel?" said Asad Yar Khan, taking Zivotofsky around his hometown. "With the knowledge that I am taking from here, it looks like the theory of Pathans having a link with Judaism is more of an oral tradition, and collecting blood samples will not help anymore. We should look into the books now for the research to come together. 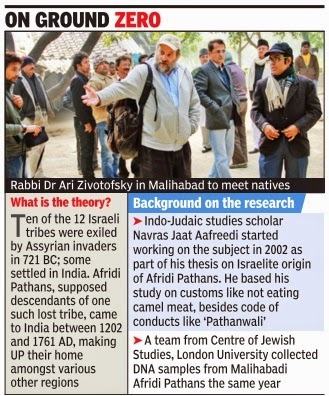 It could be a better idea to rephrase the research as 'finding a link between Afridi Pathans and ancient Israel' instead of with Jews, to whom the people here appear to be averse," concluded Zivotofsky.